WUFC officials and members of Credit Corporation management and staff were present at the handover ceremony. Members of the media and Western United players were also there to witness the landmark SBD$150 000 (USD$20 000) deal being formalised. Speaking at the handover ceremony, Credit Corporation, general manager, Tony Langston, says that his company chose Western United because the club is making an important mark in football at the moment. “As a corporate citizen Credit Corporation is taking this initiative to support an up and coming club in the national league. I think we have selected Western United because it is one of the provincial clubs to perform well in the last season of the Telekom S-League. Also Western United encompasses the spirit of cooperation by bringing together players from different islands to play football and it is an idea which we value as well,” Langston says. 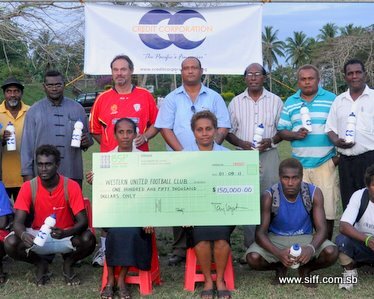 Langston also confirmed that this is Credit Corporation’s biggest sponsorship deal with any local sporting entity since setting up in Solomon Islands and his company wants to see a good return for their money from Western United. The deal is a major achievement of the club after coming through a financially difficult season. On the field their performance has been attractive given their constraints but this booster is expected to change things for the club and the sense of appreciation was apparent among the Western United officials. Western United president, Joseph Waleanisia, thanked Credit Corporation for supporting the club saying that money given will go a long way to facilitate the goals of the club for the next season. “It is a time of great need for the club and this support from Credit Corporation will really benefit the club in the coming season. I wish to take this opportunity to thank Credit Corporation on behalf of officials, players and supporters of Western United,” Waleanisia says. Waleanisia also acknowledged the club’s responsibility to promote the major sponsor and says that his management team will be working hard to ensure that Credit Corporation gets a fair return for their support to the club. According to Nelson Boso, the Western United officer for club projects, says that the sponsorship deal has outlined some of the promotional activities that they will be organising for Credit Corporation. All official club wear including the match uniform will bear the logo of Credit Corporation as will all printed official communication. The club will also be negotiating for signage at the main competition venue and in addition the naming rights will be given to Credit Corporation. Commenting on the sponsorship, Solomon Islands Football Federation (SIFF) general secretary, Eddie Ngava, says that his office is pleased to see such a deal being struck between an S-League club and a major company. “For SIFF this deal between Western United and Credit Corporation underlines the vibrancy of our national league. I congratulate both Western United and Credit Corporation for making this landmark agreement,” Ngava says. Ngava also called upon other business houses to make use of the marketing opportunity that the Telekom S-League is offering. “There is a real opportunity for business houses to promote themselves via the S-League clubs. This is a major national event which is professionally planned and executed with great media coverage and public following. It is a great avenue for business marketing,” Ngava says. Western United was established in 2010 to provide an avenue for provincial players to play in the national soccer league. It is owned by the Western Province government and managed by a committee based in Honiara. Western United finished fourth in the 2010/11 season of the Telekom S-League and later went on to win third place in the championship series.